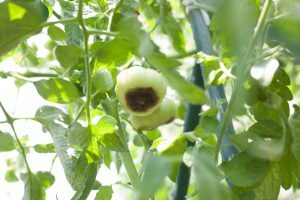 Home > Plant Care > Why are my tomatoes are turning black? The most common question, “Why are my tomatoes turning black? !”.The answer is Blossom End Rot. Blossom End Rot usually occurs earlier in the season, due to up and down temperatures, poor plant establishment, wet spring, and tapers off as the season progresses and plants become better rooted and weather adjusts. It is a physical problem, not a disease, so the ripened fruits can be eaten, just slice off the black spot if desired. What factors contribute to blossom end rot on tomatoes? Water stress (uneven soil moisture available to the plant – when plants take up moisture from the soil it goes to the foliage first, then to the fruits. The lack of even moisture affects the fruit first resulting in less calcium carried to the fruit. Lack of calcium in the soil available for the plant to take up. -Plants are trying to get established and producing new growth and fruit all at the same time. Root damages can cause this as well. Individual plants are not doing their job internally resulting in BER. Try adding calcium to the soil and til in, using lime or gypsum, before planting the plants in the ground or containers. These can also be added (top dress and light raking) once Blossom End Rot shows up on the fruit, to help correct future fruit from being affected. (Calcium Nitrate, Water soluble lime, hydrated lime, very fine lime become available quickest of the lime – apply early). It may not help if other factors are involved. Regulate your watering, to establish good soil moisture. Increase timely waterings, as well as mulching tomatoes to retain soil moisture will help. Do not overfeed the plants, in particular with high nitrogen fertilizer. Excessive growth, stimulated by the high Nitrogen, increases foliage production, which increases the need for water and calcium to the leaves, and results in the lack of moisture and calcium to the fruits. Use an all-purpose garden food, which is lower in N and higher in Potassium and phosphorus, as well as other needed nutrients, including Calcium. Cold temperatures (soil and air) will also affect the flow of calcium/water to the plant and fruit. Another good reason to not plant tomatoes too early in the season! Plant when the temperatures get warmer. Keep records as some selections are more susceptible than others. NOTE: For container gardening, potting mixes do not contain calcium / harder to keep evenly moist, etc., so it is advised to calcium to the mix / use Soil Moist to help keep even moisture levels/water as needed. The larger the pot, the less watering is needed. Temporary solutions are Blossom End Rot sprays and crushed Tums/Rolaids. You are better off correcting the overall situation causing the problem.